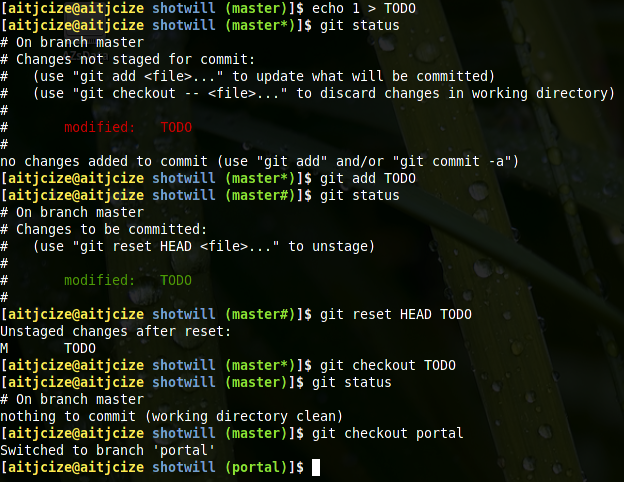 I've been using git for quite a while, and it's by far the best VCS I've ever used. The thing is, when you have a lot of branches in you project,it's really hard to keep track of what branch you are on. It would be nice to have a indicator or something that tell you just that. I've seem people using Fish shell. With Fish shell, you can simply write a ruby script to customize the prompt text, showing git status is just one of the things you can do. But since I never get used to Fish shell and at that time my projects never went over two branches, I didn't think it's necessary. Recently I am working on some projects that requires 3 to 4 branches, so I sometimes commit/edit on the wrong branch. That's when I decided to add git status to my prompt. export PS1="\[\e[1;37m\][\[\e[0m\]\[\e[1;33m\]\[email protected]\h\[\e[0m\] [\e[1;34m\]\W\[\e[0m\]\[\e[1;37m\]]\$\[\e[0m\] "
export PS1="\[\e[1;37m\][\[\e[0m\]\[\e[1;33m\]\[email protected]\h\[\e[0m\] \[\e[1;34m\]\W\[\e[0m\] \[\e[1;32m\]($branch)\[\e[0m\]\[\e[1;37m\]]\$\[\e[0m\] "
As you can see, the PRMOPT_COMMAND variable is set to the 'pre_prompt' function. In this function, I check git status and update PS1. Notice that the 'check' variable is used to determine whether you are in a git repo or not. If not, it will just restore the original PS1 variable. Note that the text between parentheses shows your current branch. If you not currently on any branch, it's set to 'none'. If the repository is not clean, there will be an extra '#' or '*' right next to the branch name. If there are changes that are not staged, '*' is append to the branch name; else if all changes are staged, '#' is appended.